Hip No. 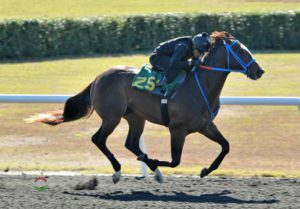 251, Golden Notion, a 3-year-old son of OBS graduate Goldencents consigned by Woodside Ranch, Agent, worked a half mile in :44 flat to post the fastest work at the distance at the Under Tack Show for the Horses of Racing Age section of the Ocala Breeders’ Sales Company’s 2019 Winter Mixed Sale. The bay colt is out of stakes placed Angels Trace, by Bellamy Road. Hip No. 194, Grand Royale, a 3-year-old gray or roan colt by Cairo Prince, turned in the day’s fastest three eighths, stopping the timer in :32 1/5. Consigned by James Layden, Agent, he’s out Helluva Hangover, by Grand Slam, from the family of grade one winner Hardest Core. Hip No. 272, Takthroadlestravld, a 3-year-old colt by Telling consigned by RiceHorse Stable (Brandon & Ali Rice), worked the distance in :32 2/5. He’s out of Chelsie’s Way, by Medaglia d’Oro, a half sister to graded stakes placed Lucky Rag Doll. Hip No. 229, V for Violence, also consigned by James Layden, Agent, turned in three eighths in :32 3/5. The dark bay or brown 3-year-old colt is by Violence out of graded stakes placed stakes winner Secret Kin, by Sea of Secrets. A pair of horses worked three eighths in :32 4/5. Hip No. 187, a 3-year-old chestnut colt by Fed Biz consigned by Craig L. Wheeler, Agent, out of Fine Candy, by Candy Ride (ARG), a half sister to stakes placed Curlish Figure. Hip No. 282, Dixieincandyland, consigned by Wes Carter, Agent, is a dark bay or brown 3-year-old Candy Ride (ARG) filly out of Dixieinyankeeland, by Dixie Union, a daughter of graded stakes placed stakes winner Descapate. Five horses worked three eighths in :33 flat. Hip No 193, Lockets Rocket, consigned by Wes Carter, Agent, is a 3-year-old dark bay or brown filly by Flat Out out of stakes winner Golden Locket, by Storm Creek, and a half sister to stakes placed Malibu Glow. Hip No. 198, Noble Commander, is a 3-year-old bay colt by Forestry out of Indian Carlie, by Indian Charlie consigned by Moonshadow Farm, Agent. He comes into the sale off a front running victory in the Woodchopper Stakes at Fair Grounds on December 29th and won the OBS Sophomore Stakes at Tampa Bay Downs last March, He has earned $143,843 to date. Hip No. 207, Ambush to Zipzag, also consigned by Wes Carter, Agent, is a dark bay or brown 3-year-old colt by Verrazano out of Little Green Light, by Smarty Jones, a half sister to graded stakes winner Too Much Bling. Hip No. 220 is G a Lemon, consigned by Craig L. Wheeler, Agent, a 3-year-old chestnut colt by Lemon Drop Kid out of Pieria, by Atticus, and a half brother to graded stakes placed stakes winner Kroy. Hip No. 275, Indian Myth, consigned by Team Work Horseman Group, Agent, is a 4-year-old bay filly by To Honour and Serve out of Claudette’s Call, by Johannesburg, a half sister to graded stakes placed stakes winner Korea. Under Tack results and videos are posted on the OBS website at obssales.com and can be viewed on kiosks in the lobby, Video Room and walking area. Horses in the Racing Age section, Hip No.’s 187 – 303, will be offered immediately following the Preferred session on Tuesday, January 29th. The 117 horses in the Racing Age section include 35 older horses, 62 three-year-olds and 20 two-year-olds, cataloged as Hip No’s 187 – 286 in the regular catalog and Hip No’s 287 – 303 in the Supplemental catalog, available in printed form at the sales grounds. A total of 525 horses are cataloged for the Preferred and Open sessions of the Sale, scheduled to begin Tuesday, January 29th with Hip Numbers 1 – 186 selling in the Consignor Preferred session, followed immediately by the Horses of Racing Age section. Hip Numbers 351 – 689 in the Open Session will be offered Wednesday, January 30th. Sales results will be available on the OBS website, updated hourly during each session of the Spring Sale. In addition, the latest news regarding OBS graduates, sales schedules, nominations, credit requests, travel information and other news relevant to OBS consignors and customers is also available. E-mail should be addressed to obs@obssales.com. Posted to Featured, Headlines, Sales News.